For those who have been following closely in the last year or so may have noticed we’ve been spending some time with a particular person known as Angie An, or more popularly known as @angiesomm on instagram. 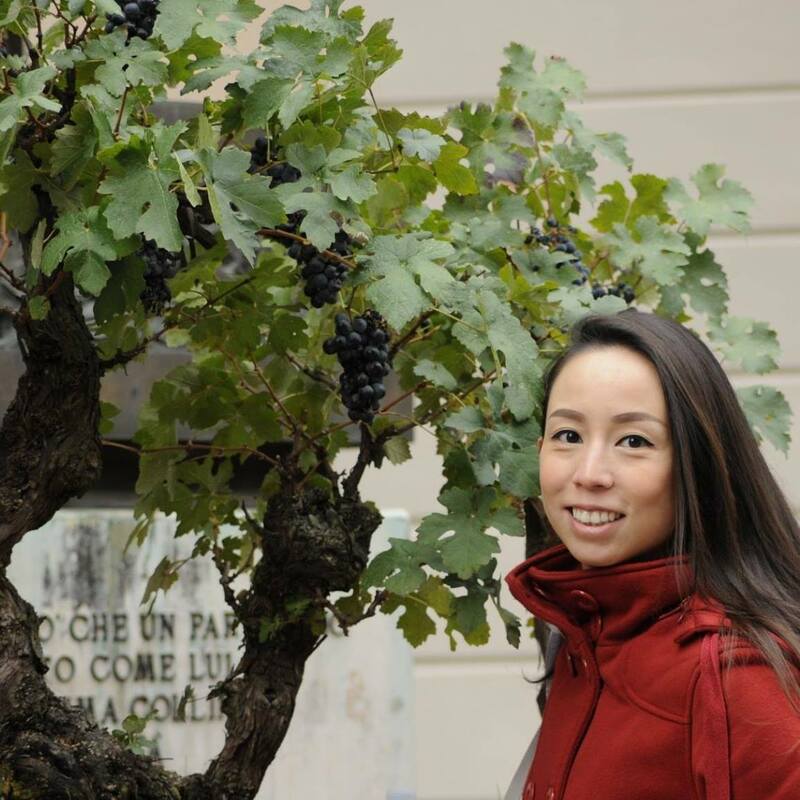 As the only bilingual English/Chinese Advanced Sommelier (certified by The Court of Master Sommeliers), Angie has slowly built a reputation as a trusted wine advisor and sommelier to the Asian community, especially in the Bay Area. When you take a look at her pedigree, it’s no question why she is so trusted, starting her career at Alexander’s Steakhouse Silicon Valley, working her way up from an opening team member to sommelier and wine buyer. During her tenure, the Silicon Valley location was awarded a 1-Michelin Star and Wine Spectator’s Best Award of Excellence! She would eventually move on to the Regal Wine Company as a Hotel Key Account Manager where she learned the in’s and outs of marketing and distribution, and eventually land herself at K&L Wine Merchants as a old and rare wine buyer specialist shortly after. After over 10 years of being in the wine industry, and notably passing the Advanced Sommelier exam (passing rate of 10%) on her first try, she decided to venture out on her own and create AngieSomm. AngieSomm today is a multitude of websites and social media accounts that provides services such as personalized wine shopping experiences, recommendations, tips, special wine buys, and wine club experiences. Yet, the best thing about Angie is not her prestige, rather, it is the person she is. As a high level sommelier, she doesn’t carry the taint that many sommelier’s have begun to show in the industry, which is the taint of snobbery. Unfortunately more often than not (from experience), many sommeliers in the modern day hold a really unappealing aura of believing they are the most knowledgeable person in the world and show forth this pompous attitude of what wine you must drink to be considered classy. They often aggressively suggest a wine that they personally think is best, sometimes even pushing for pricier bottles, without even getting to know their client! We aren’t saying that this is every sommelier, but unfortunately there have been enough incidents to make a claim that modern day sommeliers’ are really snooty (just ask anyone who works in wine industry that isn’t a sommelier). Yet, Angie is one of those refreshing sommelier’s who takes her time getting to know you, your palate, and balancing your budget without a shred of an ego. Even when we openly know her palate gravitates to old world, we aggressively always bring her Napa Cabernet to drink and she openly accepts it and enjoys it with no gripes. Where many sommelier’s care about what’s on the table, she’s the type of sommelier to care about who is at the table. For that, we find Angie to be a seriously compelling Sommelier who’s not only educated, but someone we like to be around. So where does Orchard City Kitchen come in with all of this? Well, if you take a look at the Executive Chef there, you’ll see a connection! Jeffrey Stout, was the former COO and Founding Chef at Alexander’s Steakhouse Silicon Valley. Under his tenure, he worked with Angie, and was in charge of receiving their Michelin Star. Unfortunately for Alexander’s Steakhouse Silicon Valley, differences between the shareholders and Stout caused for him to be released, and notably so, after his departure, the Michelin Star ranking they held departed as well. Nonetheless, his legacy still very much lived on with Alexander’s Steakhouse Silicon Valley, and it actually continues to be one of our favorite places to dine. 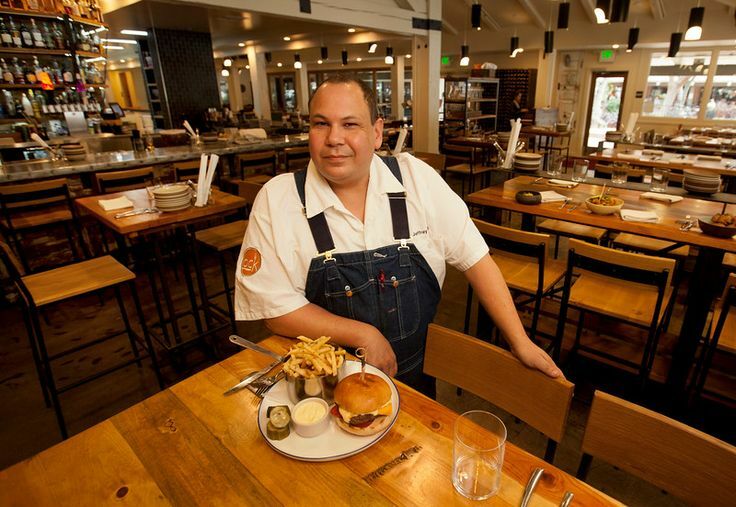 Stout moved on to open Orchard City Kitchen, which was a more casual and fast paced restaurant, but focused on quality ingredients and big flavor. 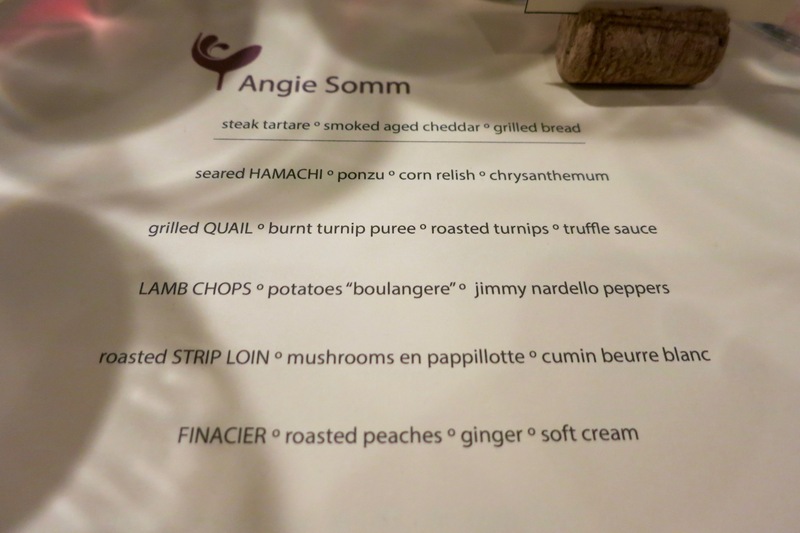 So when Angie announced a small collaboration between her and Stout, I immediately signed up for my spot to taste a Margaux focused wine night paired with Michelin Star quality chef curated meal for the modest price of $200 OTD. I arrived at the restaurant to be greeted by Angie and was promptly shown my seat, in which the wines were already sitting in my glasses being decanted. Underneath, a tasting sheet to ensure that I wouldn’t mix up my glasses, and the menu for the day. With a few opening statements from Angie, we were on our way! 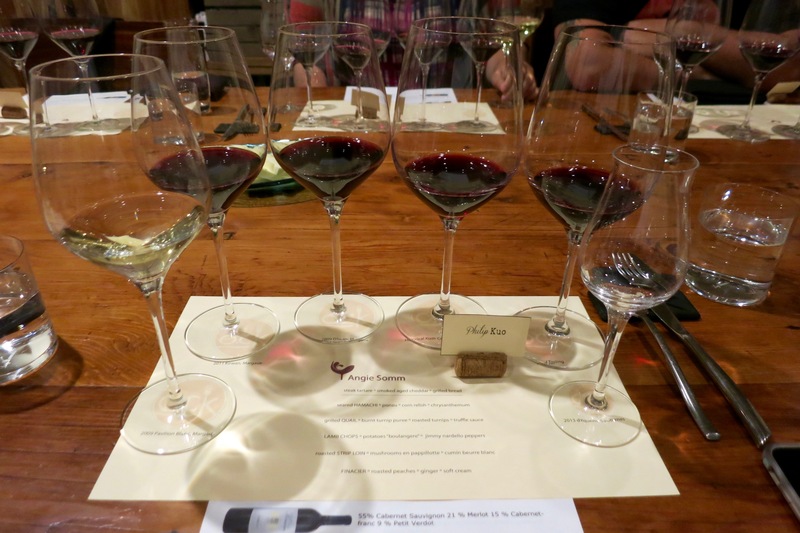 It was noted that this meal was a reverse pairing, as in the dishes were made specifically to go with the flavors of the wine. Steak Tartare. Smoked Aged Cheddar. Grilled Bread. On our tasting sheet was a wine marked “blind tasting” which really started off the night a lot of fun. A red wine that smelled of old world, big notes of sweet tobacco, mushroom, charcoal roasted meat, black fruit, cedar spice, christmas cake and black fruit. Light on the mouthfeel, it had a small herbaceous note to it followed by medium tannin and tart acidity for a medium bodied finish. This paired extremely well with our Steak Tartare, as the dish itself featured a nice smoky savory cheese toppled over the tartare, topped off with a fire grilled bread with garlic and pepper spice. 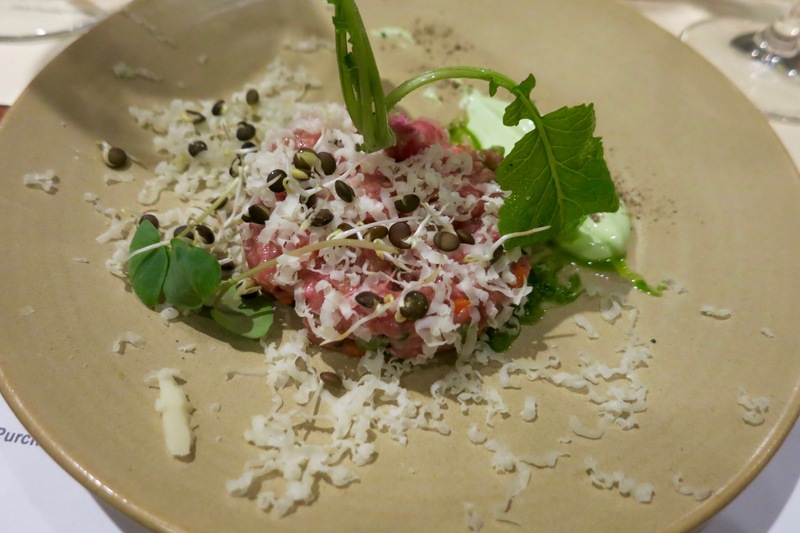 The acidity from the wine really helped cut through the cheese, and the fruit, earthy and meaty flavors really added to the milder taste of the raw beef and rounded out the dish out nicely. The wine was eventually revealed to be 1996 Chateau Kirwan (I guessed wrong). Seared Hamachi. Ponzu. Corn Relish. Chrysanthemum. Our second dish was a Seared Hamachi with ponzu and corn relish. The dish was slightly seared on one side and left raw on the other, creating an incredible texture on the fish alone. The corn relish gave a nice sweet, vegetal, element to the dish while providing a nice and clean savory acidity to the fish. 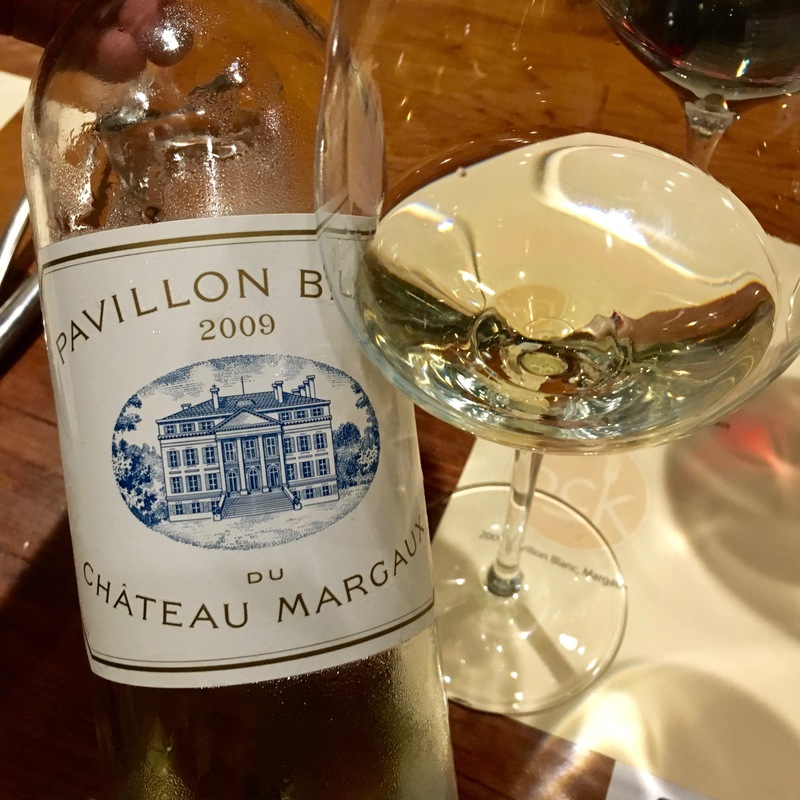 The pairing was a 2009 Chateau Margaux Pavillon Blanc which is the extremely low production Sauvignon Blanc from Chateau Margaux. Incredible floral notes of honeysuckle, lemon, grapefruit, white florals, vanilla, roasted almonds, apple and crushed minerals. Fantastic acid on the palate and boasted a luxurious and balanced mouthfeel that had a finish that went on and on. The Hamachi complimented the Pavillon Blanc impeccably, the seamless transition of acidity between the dish and wine was almost ethereal! 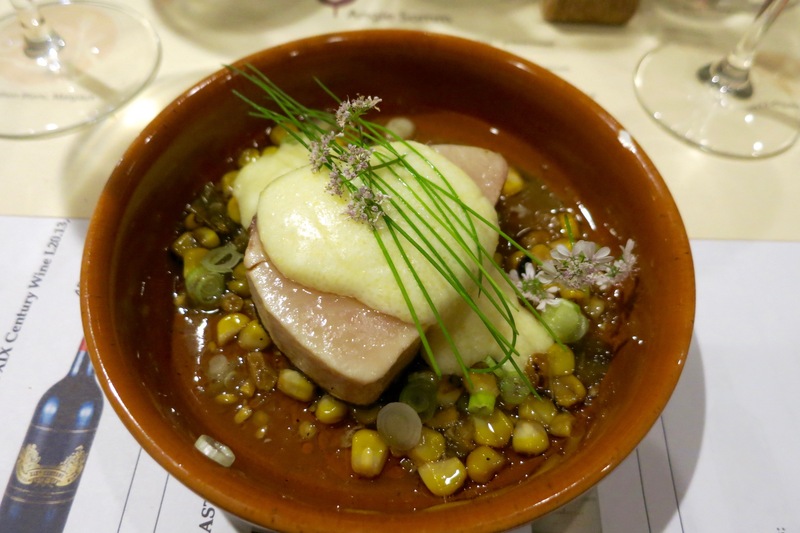 The depth of the wine really harmonized the dish as it was almost like the wine belonged in the dish itself, coating the Hamachi with layers of floral fruit and citrus essence, like a fresh fruit salsa that tops a beautifully cooked fish. Grilled Quail. Burnt Turnip Puree. Roasted Turnips. Truffle Sauce. Our third course of Grilled Quail featured the quail in a puree of burnt turnips with strips of roasted turnips, truffle sauce and shaved truffles over it. 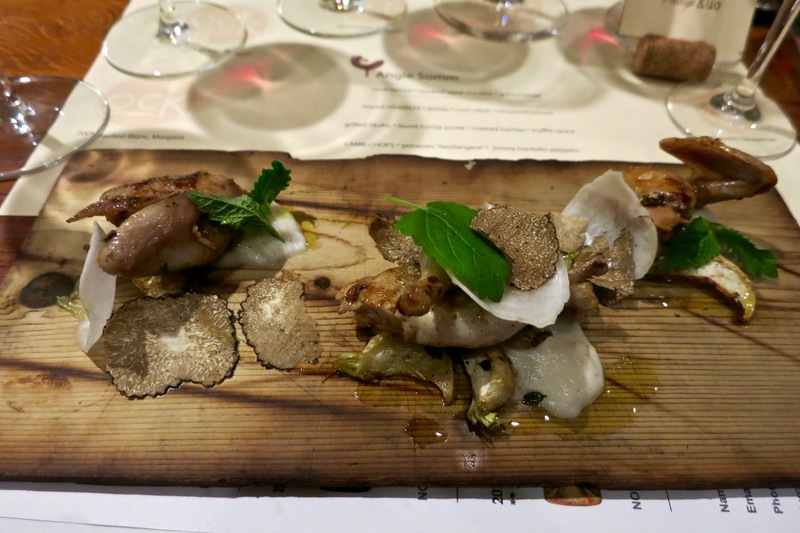 The quail itself, was extremely tender, lightly salted, allowing for the natural quail flavor to come out and intermingle with exterior flavors of truffle and turnips. 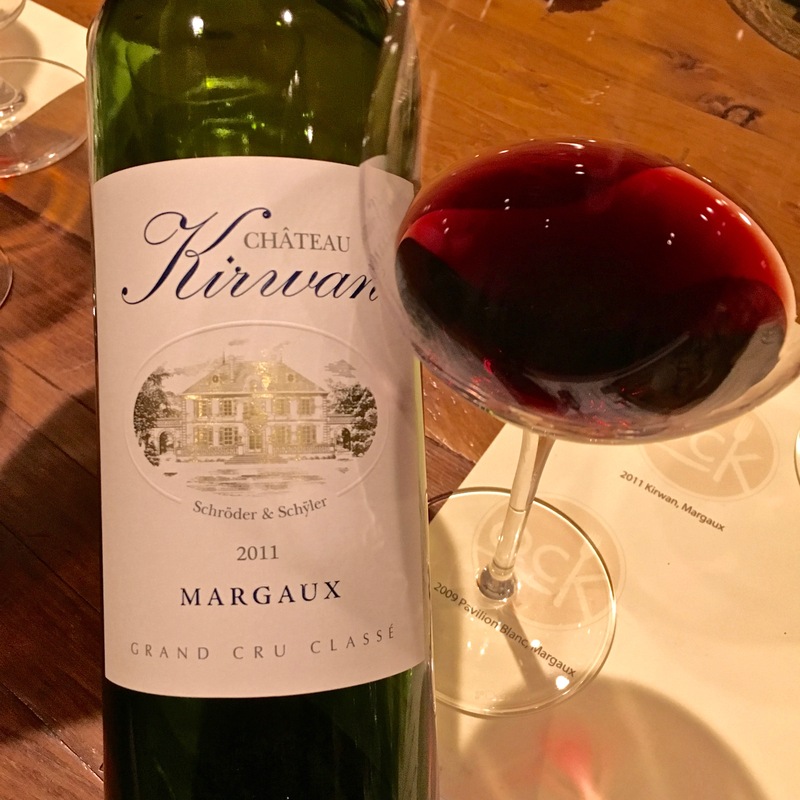 The wine pairing was a 2011 Chateau Kirwan which featured notes of blue florals, cherries, toasted cedar, rhubarb, and raspberries. Extremely lean on the palate, very soft on the mouthfeel, it finished with medium acidity with easygoing tannins. The wine paired fairly well with the quail, as both dish and showed a level of restraint and gentleness and was more of a melding of flavors for a gentle outcome. It was a definitely a good choice to pair a lighter bodied wine with a fragile and less heavy meat like quail, and the gentle acidity and fruit layers paired something reticent of cranberry and turkey. Lamb Chops. Potatoes “Boulangere.” Jimmy Nardello Peppers. Our fourth course was one of the two heavier courses, lamb chops with potatoes made in lamb fat, lamb fat aioli and roasted peppers. I loved how the chef incorporated back the fat into the dish with the potatoes, each bite was layers of hearty lamb, not to mention cooked perfectly. The peppers added a little lighter savory and roasted notes to round out the dish a little bit, but this was clearly a full throttle lamb dish where the lamb permeated through everything. 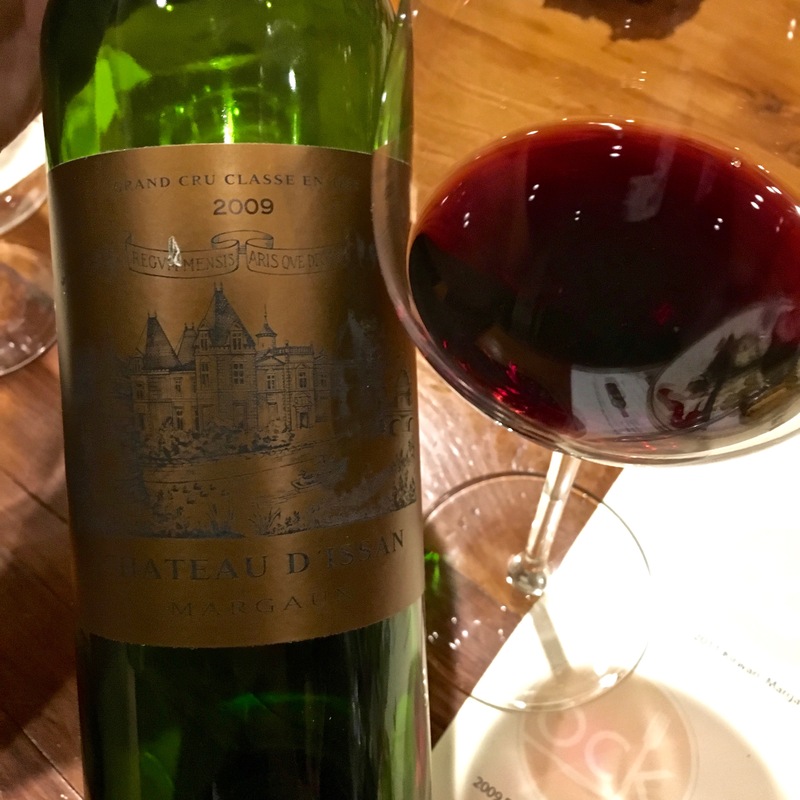 We were paired with a 2009 Chateau d’Issan featured huge fruit notes of black cherries, tobacco, smoke, oak, truffle, licorice, forest floor and espresso. The mouthfeel was plush and soft, extremely perfumed, with coating notes of sweet fruit and a finish of silky tannins and fresh acidity. The pairing was stellar, as a big young Bordeaux was able to complement the richness of the lamb dish. 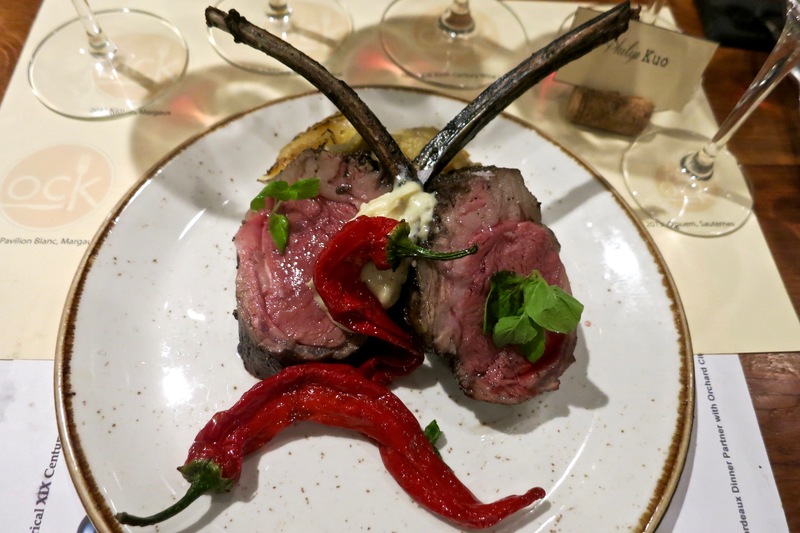 The wine added a much needed sweetness to the dish, and the freshness of the acidity helped lighten it up overall and make it easy on the palate, allowing me to continue to wolf down the lamb and keep coming back for more. Roasted Strip Loin. Mushrooms en Pappillotte. Cumin Buerre Blanc. The final course before dessert, we had a roasted strip loin with a cumin buerre blanc, and next to it mushrooms that had been steamed in its own essence. The mushrooms had a huge meaty aroma to it, making it almost stand out by itself and seemed to almost dominate the beef. The strip loin was cooked perfectly, juicy and was beautifully seasoned with the right amount of salt, allowing other flavors to meld in without making overly savory. 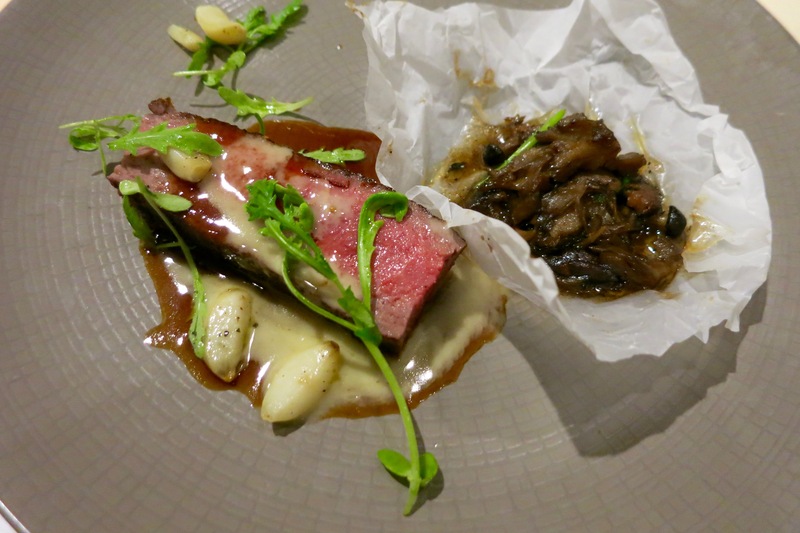 While I tried the steak and mushroom together, I preferred to eat them separately as I felt the mushrooms were so powerful in aroma and flavor that it felt like putting them together would mask the brilliance of the beef. We paired this dish with a Chateau Palmer Historical XIXth Century Blend Lot 20.13. This was a very special and rare wine to try, as it was only released in a few vintages and had a bunch of history to it. 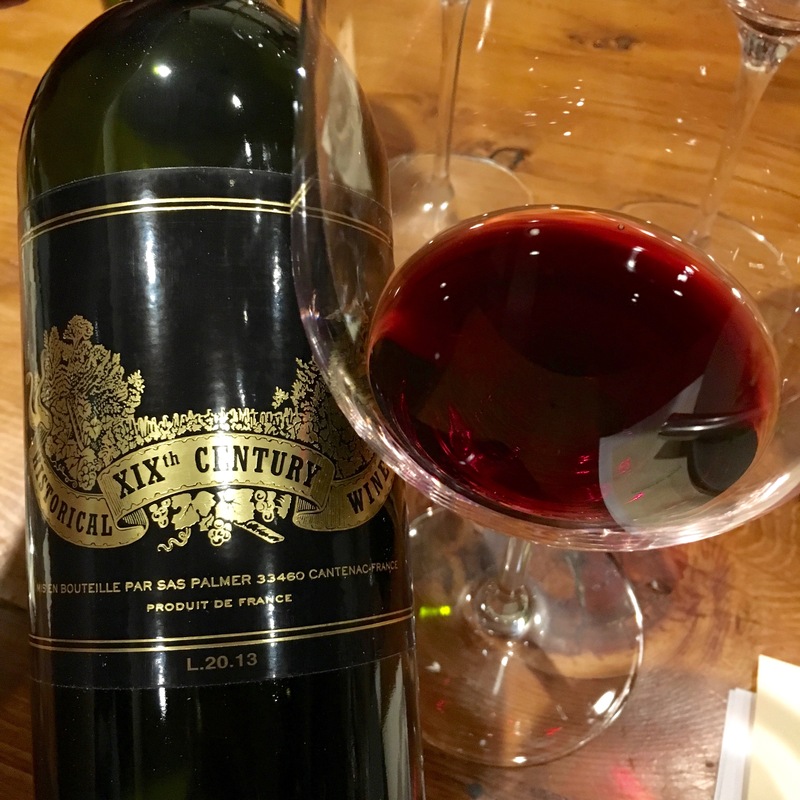 In 2004, Chateau Palmer released this wine as an homage to the wines that were poured in the 19th Century, which consisted of a blend of Merlot, Cabernet Sauvignon, and Syrah. Since the Syrah came from Northern Rhone, the grapes didn’t all came from Margaux or Cotes du Rhone, so the location had to be stripped from the label. Also, since the grapes did not all come from Chateau Palmer, the Chateau label had to be stripped as well. So the wine was sold as Vin du Table (table wine), and since it was marked as such, the vintage was stripped as well. Yet, despite the minimal labeling the wine was very much full. Notes of black cherries, cassis, herbs, peppercorn, tobacco, charcoal, oak and black raspberries made for a very full and fresh mouthfeel with plenty of persistence and depth. I paired the wine separately with the mushrooms and steak and it worked out wonderfully, with the wines fresh acidity, and mouth coating fruit adding layers to the rich and meaty savory taste of the steak and mushrooms. It really helped round out the heavy dish, and it was particularly fun to create a vegetarian pairing with the hearty mushrooms and compare it to your classic big red and steak combination. Finacier. Roasted Peaches. Ginger. Soft Cream. Our final dish to the night was a dessert of Finacier, grilled peaches with ginger and ice cream. 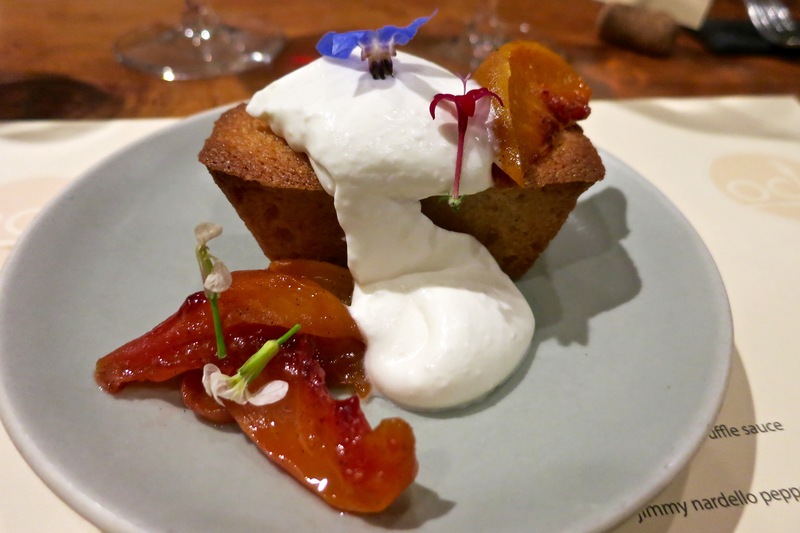 The little french almond cake was light and moist on the interior with a beautiful exterior crispiness to it giving it a wonderful texture. The ginger seemed to have been baked into the cake itself, and it gave it a really wonderful zesty sharp balance to the creamy almond. Just by itself it was already fantastic, but adding cream and grilled peaches was like having extra icing on the cake. Although not from the Marguax region, we paired the cake with the classic dessert wine, Chateau d’Yquem. 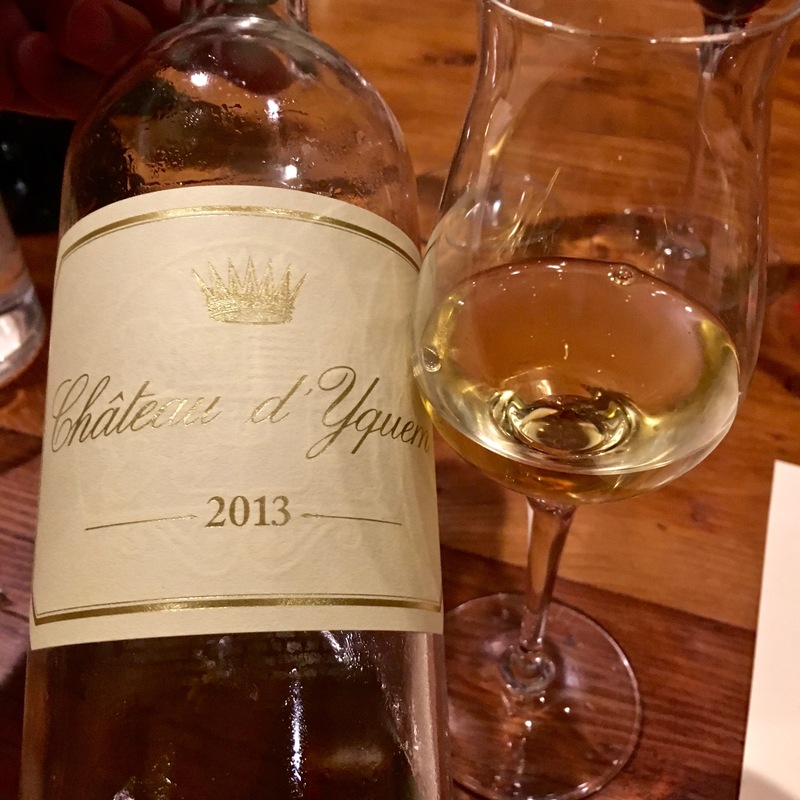 The 2013 Chateau d’Yquem was classic brilliance with notes of apricots, pineapple, white florals, lemon rind, honey, grapefruit, mango, botrytis spice and toasted brioche. Despite its layers of massive honey and fruit, there existed its classic freshness with beautiful acidity into a finish that lingered on the palate for an eternity. Smelling this alone would make you dizzy enough. The wine paired very well as it complimented the Finacier’s light and crisp texture, adding depth and sweetness to the dish, while maintaining its freshness that worked incredibly well with the ginger notes of the dish. In a whole, the meal was incredible, being able to taste some of the lesser known Margaux houses that performed splendidly to accompany stellar Michelin Star dishes. A definite plus that I certainly enjoyed was that all the dish portions were huge (I definitely saw some people take a few things to go) and I was happy to leave full and satisfied. I think Angie did an incredible job with Jeffrey to come up with a very special meal where everything just worked perfectly. Not to mention Angie was in typical form, being a gracious host, and ensuring that every guest received attention while making sure to balance time to educate us about the wines. Her warmth and attitude towards all the guests made the ambiance much better, as the meal was not stiff at any point and it allowed for an evening of camaraderie and friendship. While it is uncertain if Angie will do another of these events as this was somewhat of a special event, if there is, I’ll be waiting to sign my name up because Angie is the type of friend and sommelier you want at your dinner table.